I like a good variety in my breakfasts. The one day an oatmeal, the other day a smoothie and on some days banana icecream! Super yummy and you don’t have to feel guilty about it because it’s healthy as well! 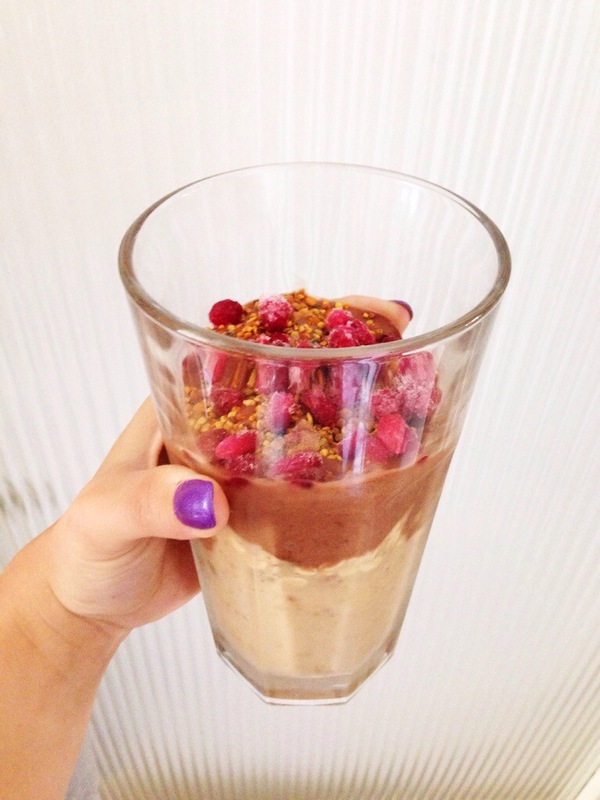 Mix one frozen banana with 50 ml of almondmilk and the almondbutter into a smooth ‘icecream’, put into a glass or bowl. Put the muesli on top. Mix the rest of the banana with the other 50 ml of almondmilk and the cacaopowder into the chocolate icecream, put into the glass as wel. Serve with the pommegranate seeds and the beepollen. Posted in Breakfast, Juices and smuices, recipesTagged breakfast, dairyfree, fit, food, fruit, glutenfree, glutenvrij, healthy, hetalthy breakfast, icecream, natural, raw, sugarfree, suikervrij, vegan, zuivelvrijBookmark the permalink.